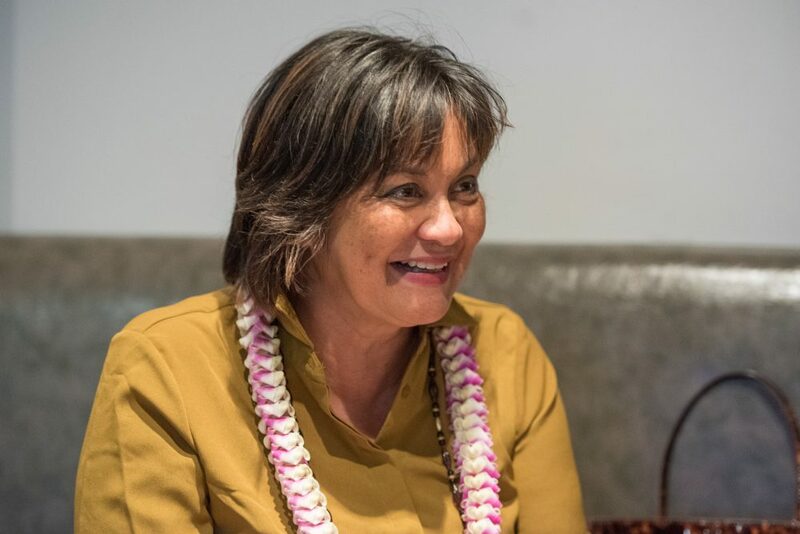 Catherine Cruz is host of Hawai‘i Public Radio’s “The Conversation.” Before taking part in a Zócalo/Daniel K. Inouye Institute “Pau Hana” event panel discussion titled “What Can Hawai‘i Teach the World About Climate Change?” she spoke in the green room about long-distance swimming, living through typhoons, and overcoming her natural shyness. A lot of my husband’s relatives—oil paintings from folks that live in Philadelphia, where his family came from. It’s a great way to know that my kids have a connection to American history, because we have a lot of furniture from Philadelphia and the paintings of people who lived out there. Was there a teacher or professor who really helped influence your career? Not really, because I kind of got into [this line of work] by accident. I went home after a couple years of college, and I applied to a TV station, just to actually work cameras and edit. And they said, “Gosh, we don’t have any openings, but can you help out in the news department?” And then I kind of got hooked on news. This was at a TV station here? No, in Guam. But there was a marine biology teacher—because I originally thought maybe I’d go into marine science—and I took lots of classes when I was back there at home. I didn’t go into marine biology, but I use all of that because I kind of have this interest in the ocean. Do you have a particular water-related activity? I’m a swimmer, I do long-distance swimming. What’s the longest you’ve ever done? I go out on the weekends with my swim group, we’re a pod, and we usually do about two miles. We go all over the island [Oahu]. I’ve done the Waikiki Roughwater Swim, where you go from one end of Waikiki to the next. I thought that was really cool stuff. Then I found out there was a double Roughwater, so you go four and a half miles. We go all over. Actually, I never imagined I would be doing long-distance swimming, because I kept flunking my beginner’s swimming lessons because I could just not get myself to dive in the water. And so they would just keep flunking me. This was in Guam, growing up at the USO [United Service Organizations]. I usually try to work on the things I’m weakest at. So I figured I needed to work on this swimming part. And I’ve always thought that writing was hard for me, and being in front of people—because I was always very shy—and so I had to work on those things. And so this job—and [before that] I was a TV reporter for about 35 years—and so it forced me to just kind of forget myself and just kind of go after the story. I wouldn’t have guessed about the shyness. Yeah! I was a good little girl.